One of the most loving and protective mothers in the animal kingdom is the mother hen. She begins preparing her nest long before her babies arrive, plucking feathers out of her tummy so that she can warm the eggs directly with her skin. Mother chicks begin vocalizing to their babies long before they hatch so that they know the sound of her voice. 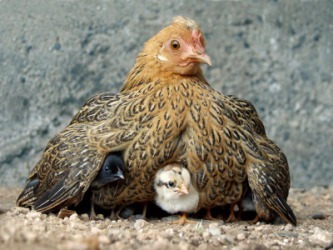 Upon hatching, she warms them under her soft feathers and protects them from predators, even those much bigger than herself. Unfortunately, the one predator she cannot defend her precious chicks from is one that takes the lives of over nine billion chickens each year in the United States alone. Humans. Even though most people think that egg and milk production doesn’t hurt the animals, this misconception couldn’t be further from the truth. Of the 9 billion chickens killed for human profit every year, approximately 450 million die in the egg industry (1). When they are only a few days old, baby chicks are sexed by workers who tell them apart by the length of their wing feathers. Male chicks, who are of no use to the egg industry, are killed immediately either by suffocation in trash bags, by being tossed into a commercial meat grinder while fully conscious, or by being vacuumed up onto an electric kill plate (2). Baby chicks who are born with disabilities face the same terrible fate as the males. Once sorted, if they are not immediately killed in the aforementioned ways, they are used as packing peanuts to ship healthy chicks to feed stores to be purchased as backyard chickens. Once they arrive, these chicks are nearly always dead or are tossed aside since they will not be profitable to the business. If the baby chicks survive, they go on to even more horrific circumstances where they are used to lay eggs for people before being slaughtered at only 18 months of age when their reproductive systems wear out. Chickens have instincts just like all animals, and love to scratch, preen, dust-bathe, nest, explore, forage, and roost. In factories, because chickens are denied all of these natural behaviors, they become incredibly distressed and even neurotic. They express this anxiety by pulling feathers from themselves or pecking at each other. The egg industry deals with this by removing about half of the upper beak in a painful procedure. The chicks’ sensitive upper beaks are lazered off without painkillers so that they don’t harm themselves or each other in the stressful conditions of the factory. This mutilation by humans is standard practice for what the industry calls the “well-being” of the birds (3). A recent report done by the U.S. Humane Society reports that “Most egg-laying hens (95%) are confined in small, barren battery cages. The most commonly used cages hold 5-10 birds. A typical U.S. egg farm contains thousands of cages, lined in multiple rows, stacked 3-5 tiers high. Industry guidelines stipulate that each caged hen may be afforded 432.3 cm2 (67 in2 ) per bird, an amount of floor space equivalent to less than a single sheet of letter sized paper.” These hens are never able to spread their wings or stretch out and can barely turn around. In many warehouses, if they manage to escape their cages, they fall into the “pit,” a giant pool of chicken manure where they are sure to drown. At eighteen months of age, if they survive the conditions of the factory, they are killed and used for products from fertilizer to pet food. These intelligent, social animals who can naturally live over ten years, never see the sun or feel a moment of compassion in their short lives. 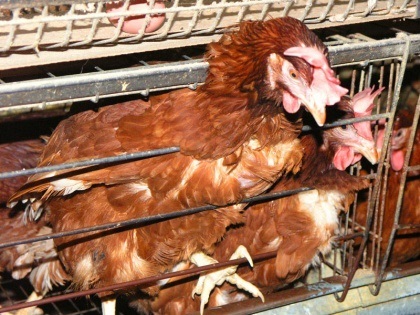 In some factories, when egg production declines, forced molting is used to increase laying. Lights are turned off and chickens are deprived of food and water for up to a week at a time. This cruel yet legal husbandry practice stresses the birds out to such extremes that their feathers molt. The molting triggers increased egg production, so that the industry is able to get several more months of profit out of the birds. Many consumers have recently begun to purchase free range or cage free eggs because they are led to believe that these choices are kinder to the animals. While the labels suggest this is true, it is not the case as the language is manipulated and loopholes are used to keep consumers buying and profits up. Woodstock Farm Sanctuary recently gathered evidence from sources that investigated the problem. “ Because “humane” labeling terms are not meaningfully defined or enforced, suppliers are notorious for manipulating intentional loopholes in these loosely interpreted standards (5). In a recent report, even Trader Joe’s “cage free” egg suppliers were found to debeak their hens, which means the birds were also living in severely crowded facilities. (13) Massive confinement operations, like Sparboe Farms and Perdue Farms, that confine millions of chickens in deplorable conditions, are awarded “humanely raised” certification through a USDA-sponsored fraudulent labeling scheme. (7) (Read the full Humane washed report, or watch undercover footage of these so-called “humanely raised” practices. (8) )” What this essentially means is that the hens are still kept in extremely confined conditions and allowed a tiny enclosed space outside (approximately the size of a dog run for hundreds of hens) so that they can claim they have “outdoor access.” They are still killed as babies (eighteen months old) after a life of cruelty and confinement. This also means that the industry takes advantage of consumers who care about animal welfare by preying on their emotions and manipulating language to increase profits. There is nothing humane about taking the life of someone who does not want to die. Showing compassion to chickens means giving up eggs. There are many alternatives for both baking and cooking and resources for tasty and healthful recipes are easily accessible. Tofu - great to scramble with veggie sausage and potatoes for a tasty breakfast! Vegan Egg - A new alternative that works in baking or can be scrambled to replace eggs. Beyond Egg - A tasty, healthy and compassionate alternative that is versatile in baking and cooking. Unsweetened applesauce (¼ cup for each egg in baking) - low in fat and excellent in cobblers and brownies. Ground flaxseed (1tbsp whisked with 3 tbsp of water) - Omega 3’s, works well in muffins, pancakes, waffles, and oatmeal or nutty cookies. Baking soda (1tsp) and vinegar (1tbsp) - helps cupcakes, cakes, breads and other baked goods to rise. Silken tofu (¼ cup blended in blender for each egg) - little to no fat, low in cholesterol and high in protein and fiber, great to add to dense pastries, brownies, cakes, or muffins. Banana (½ of banana will replace one or two eggs in baking) - benefits include potassium and magnesium and excellent binding abilities in cakes and breads. Just like in the commercial industry, the baby chicks you purchase from feed stores support the idea that these animals' lives are commodities to be used how humans wish. Chicks are born in the same hatcheries, never know their mothers, and most baby roosters are ground alive or dumped into dumpsters to suffocate since they do not lay eggs. The roosters who make it to feed stores generally are sold with the baby hens and are later dumped or killed because they are noisy and not allowed in neighborhoods. Besides these startling facts, the chicks who are blind, sick, or weak are placed around the edges of the boxes and used as "packing material" during shipment from hatcheries to feedstores. If they are not killed during shipping, most feed stores break their necks or otherwise kill them upon arrival because they are not willing to syringe feed them or put in the incredible amount of time it takes to bring them back to health or help them acclimate to their disabilities. Purchasing baby chickens keeps this cruel cycle going and teaches children that animals who are "cute" can be enjoyed and if they are "inconvenient" or "too much work" they should be disposed of. This is not consistent in teaching compassion and responsibility. If you want to get to know chicken friends, but don’t want to support the killing of baby male chicks and those with disabilities who are considered “byproducts” of the industry, consider adopting rescued chickens. Feeding them their own eggs back (boiled and crushed with the shells) helps to replace critical calcium that is lost with egg over-production. Chickens who are liberated from the egg industry will get a second chance at life and you will get to know these special, curious birds as friends not food!